Aromaxyl – irreversible steroidal aromatase inhibitor, structurally similar to the natural substance androstenedione. In postmenopausal women, estrogens are produced primarily by conversion of androgens to estrogens by the enzyme aromatase in peripheral tissues. Blocking estrogen formation by inhibiting aromatase is an effective and selective treatment for hormone dependent breast cancer in postmenopausal women. The mechanism of Aromaxyl drug action is due to the fact that it binds irreversibly to the active fragment of the enzyme causing its inactivation. In postmenopausal women, Aromaxyl significantly reduces the concentration of serum estrogens from the dose of 5 mg, the maximum reduction (> 90%) is achieved at doses of 10-25 mg. In postmenopausal women with breast cancer who received 25 mg daily, the overall level of the aromatase enzyme in the organism was reduced by 98%. 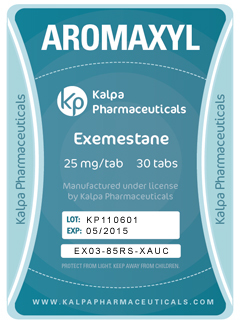 Exemestane has no progestogenic and estrogenic activity. It reveals only a slight androgenic activity, especially when used in high doses. Aromaxyl has no effect on the biosynthesis of cortisol and aldosterone in the adrenal glands, which confirms the selectivity of drug action. In this regard, no need for replacement therapy with glucocorticoids and mineralocorticoids. In applying the drug even at low doses, there is a slight increase in the content of LH and serum FSH, which is characteristic of drugs of this pharmacologic group and probably develops on the principle of feedback on the pituitary level: reducing the concentration of estrogen stimulates the secretion of gonadotropins by the pituitary gland, also in postmenopausal women. For adults and elderly patients the recommended Aromaxyl dose is 25 mg 1 time/day, preferably after meals. In early breast cancer drug treatment is recommended to continue for as long as the total duration of successive adjuvant hormonal therapy did not reach 5 years. Treatment of patients with breast cancer is a long common. If signs of disease progression of tumor or when the contralateral breast cancer treatment, Aromaxyl should be discontinued. When liver or renal failure, dose adjustment is not required. Adverse effects when using Aromaxyl in a dose of 25 mg/day are low to moderate.